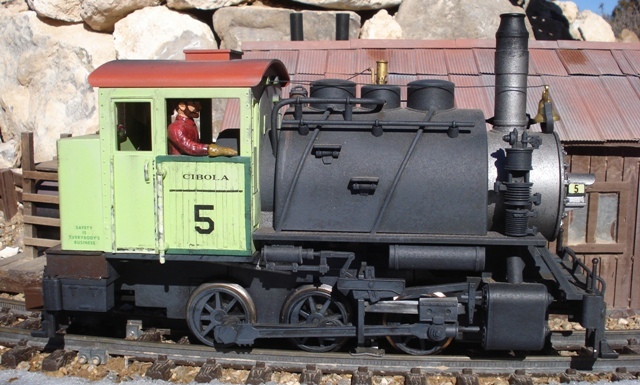 The Cibola operates 7 steam engines. They are modeled for either wood or oil. None are coal. All batt/rc conversions are Airwire G-2 or G-3 boards with Phoenix sound cards. Currently I am using NiMH 8.4 V 5000 Mah flatpacks. They are all the same size and can be quickly swapped from the charger or between engines. See the Electronics page for details and thoughts on these systems. # 5 Oil fired 0-6-0 Saddle Tanker. 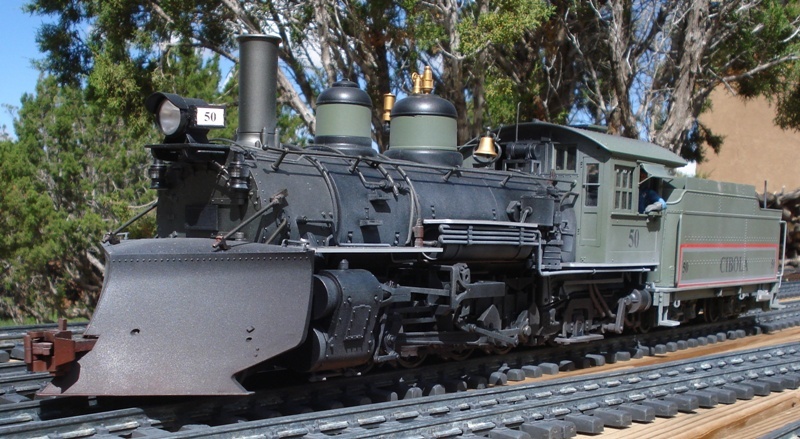 This is a Piko DC analog powered engine. There are no plans to convert it to batt/rc as the mine loop is track power. It has had some extensive detailing. 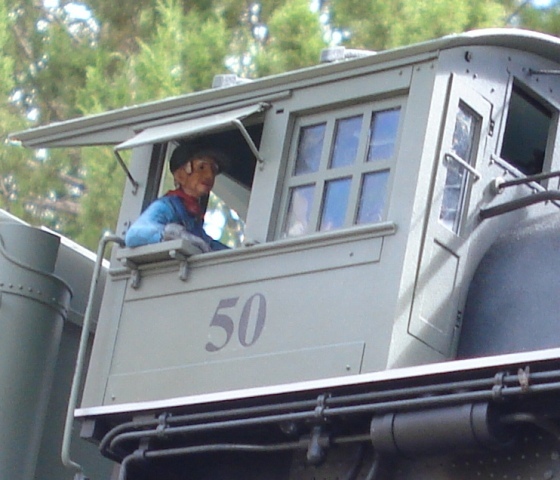 The cab has been raised by 1/2″ and the doors remodeled to bring it up to 1/20.3 scale. The crew is by Carlos Spirito. 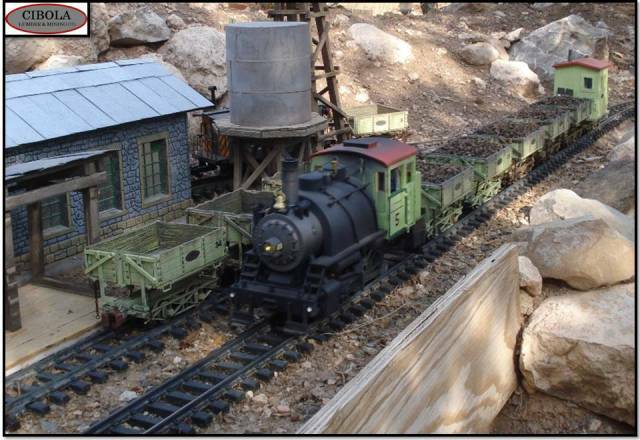 In concept the engine serves the mines hauling ore supplies and miners between the main yard and the mine heads. #17 Wood fired 2-4-4 Forney. This is a Bachmann track powered engine (awaiting conversion) from the Spectrum series. Repainted and decaled by me. The only remodeling is the change of the coal pile for wood. The crew is from Just Plain Folks. Currently the engine is DC analog so it cannot be used on the layout. It goes to the NMGRR shows and runs on the club track. I am considering converting it to RC/Batt. If I do it I will have to get LION batteries and another charger. 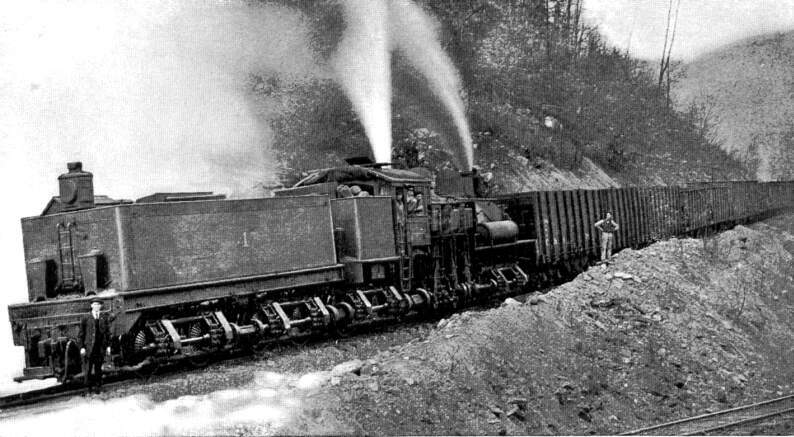 In concept it is used in the log camps for shunting. #34 Wood fired 2-8-0 Consolidation. This is the real workhorse on the layout and to date the best puller. 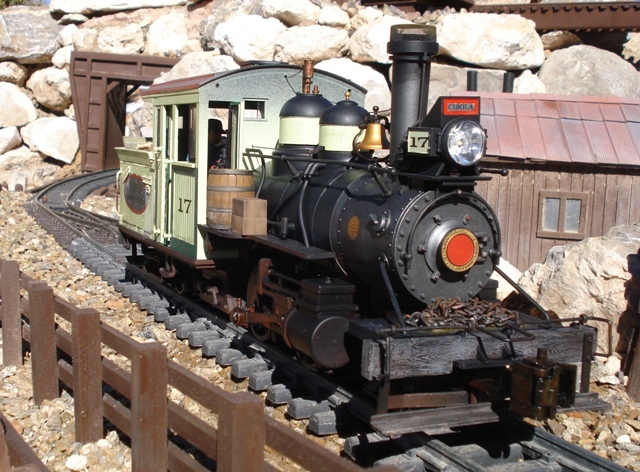 This is a Bachmann battery powered engine from the Spectrum Series. It has a custom made gearbox with titanium gears and a 19 volt Pittman motor. Painting and decals by me. The crew is from the Fine Folks line. The paint scheme is post merger with the new logo. 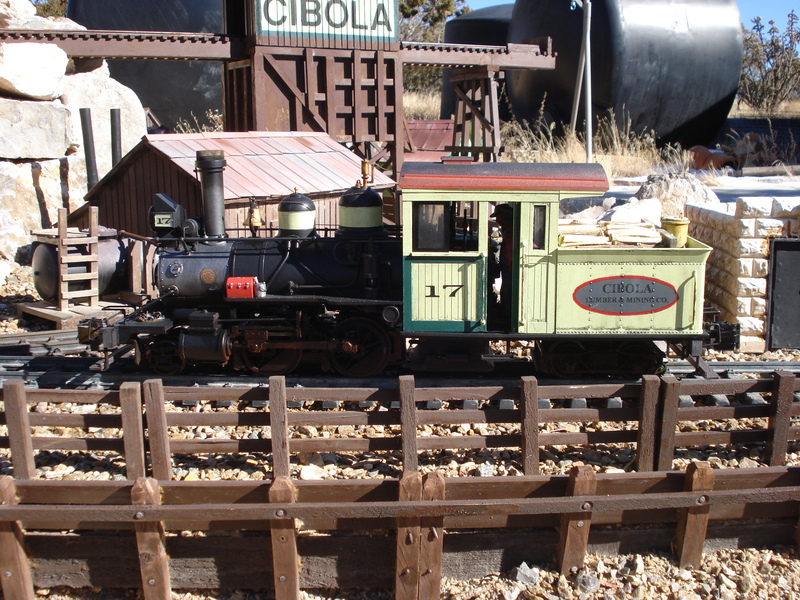 In concept the engine is used on the branchline for freight and to haul short loads from Copes Yard down to Cibola. On occasion it services the lumber camps with supplies or crew rotation. #37 Wood fired 2-8-0 Consolidation. This is a Bachmann battery powered engine from the Spectrum series. It has a custom made gearbox with a 15 volt Pittman motor. The paint scheme is pre-merger with the mining company. It features an open rear cab with an interior light. The crew is from Scale Humans and Brick Works. In concept the engine preforms the same job as #34. #50 Oil fired 2-8-2 K-27 Mudhen. This is a Bachmann battery powered engine from the Spectrum series. It is has the original drive motor and brass gears. The engine is painted for mainline service. The crew is by Railway Avenue. In concept this engine pulls the freight between the interchange yard at Cibola and all other points. #51 Oil fired 2-8-2 K-27 Mudhen. This is an Accucraft battery powered engine from the AMS line. I have swapped out the original 19 volt motor for a 24 volt one. It is painted for mainline use in Sage Green. The crew is from Railway Avenue. I expect it to be the strongest puller on the layout. In concept it will be dedicated to passenger service as I hope to finish the remaining three cars very soon. #70 Oil fired 75 ton 4 truck Shay. This is a kit-bashed four truck Bachmann battery powered engine from the Spectrum series. It has all new die-cast trucks. It is still in the construction phase. The idea was inspires by my train buddy Bart Salmons and is based on the heaviest geared loco ever built by Ephraim Shay. 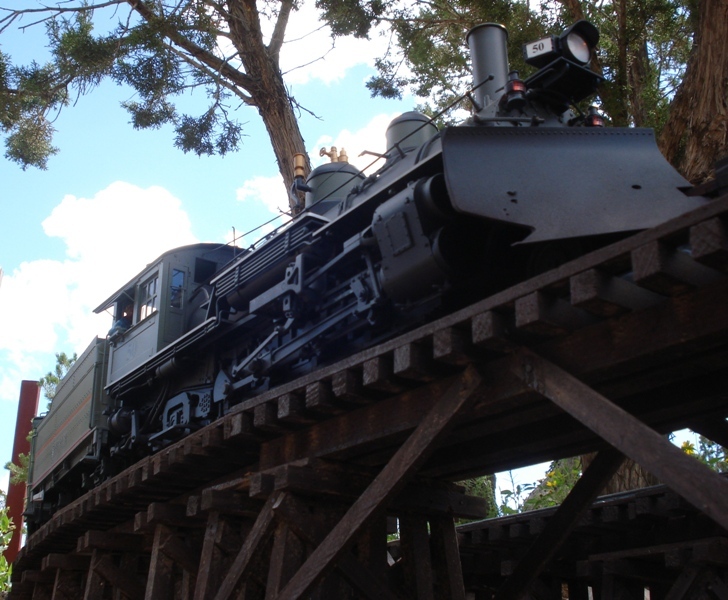 In concept it is the prime mover on the branchline hauling log loads from the camps into the sawmill at Albuquerque. Unassigned Bachmann C-19. I just bought this and have not decided if I will keep it or not.